Environmental conditions clearly influenced the cultural development of societies in the Intermountain West, but how did interactions with neighbors living along the region’s borders affect a society’s growth and advancement, its cultural integrity, and its long-term survival? Relationships among different societies are, of course, crucial to the spread of information, innovation, and belief systems; to the maintenance of exchange and mating networks; and to the forging of ethnic identity. In these ways and others, intergroup relationships can be as strong a force in shaping a society’s identity and future as are local social and economic dynamics. Meetings at the Margins focuses on the ways in which different ­societies in the Intermountain West profoundly influenced each other’s histories throughout the more than fourteen millennia of prehistoric occupation. Historically, inhabitants of this region frequently interacted with more than forty different groups—neighbors who spoke some two dozen different languages and maintained diverse economies. 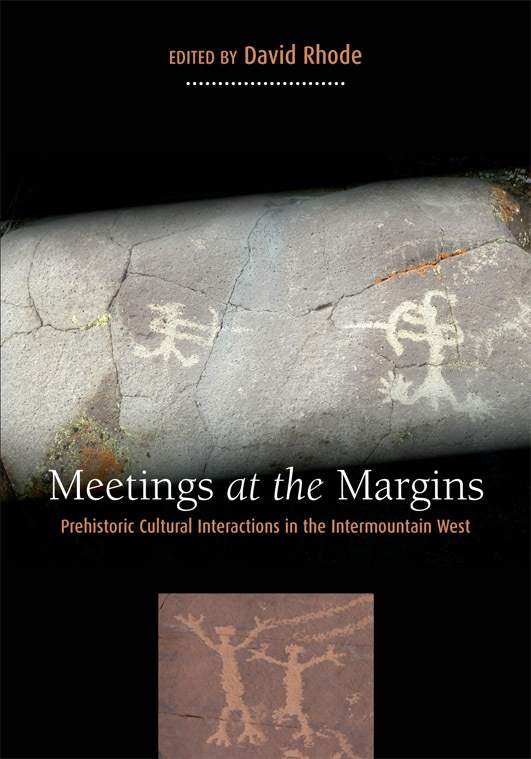 The contributors to this volume demonstrate that in the prehistoric Intermountain West, as elsewhere throughout the world, intergroup interactions were pivotal for the dynamic processes of cultural cohesion, differentiation, and change, and they affirm the value of a long-term, large-scale view of prehistory. David Rhode is a research professor with the Desert Research Institute in Reno, Nevada, where he works as an archaeologist and Quaternary paleoecologist. Rhode is the author of Native Plants of Southern Nevada: An Ethnobotany (2002) and co-editor (with David Madsen) of Across the West: Human Population Movement and the Expansion of the Numa (1994), both published by The University of Utah Press.